Please see this article of benefits to eating grass-fed beef. What Is the diffrence between Grass-Fed and Grain-Fed? Read this article to better understand why Grass-Fed Beef Is Better for You, Better for the Planet and Better for the Cows. What is the diffrence between “hanging” vs.”packaged” Weight? • Hanging weight is the weight of the beef before processing. • Packaged weight is the weight after processing and packaging. Our meat is sold by the hanging weight—the weight of the meat as it hangs at the butcher shop after slaughter and before cutting. As the beef is aged for up to 14 days, the weight will decrease from some dehydration. When the cuts are made, there will also be some weight loss due to removal of bone, excess fat and gristle. The meat you take home will be 55-75% of the original hanging weight. The resulting packages from the carcass are then equally divided into groups of 2, 4, or 8 giving you purchasing packages of eighths, quarters, or half. That is to say, none of the premium cuts are removed from the portions. Your beef will arrive frozen, labeled, and double wrapped in freezer/butcher paper with a shelf life up to two years in the freezer..
What’s in the Hamburger & Steak Package? 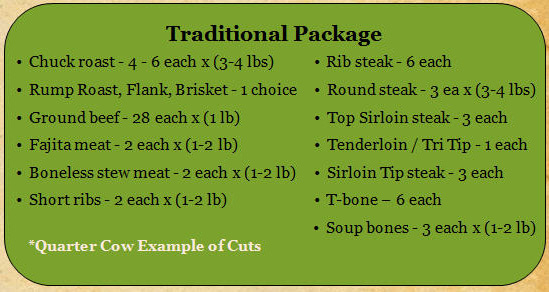 This package will include hamburger and choice steak cuts. What cuts of beef are in the Traditional Package? The following is an example of what cuts to expect with a quarter of beef. 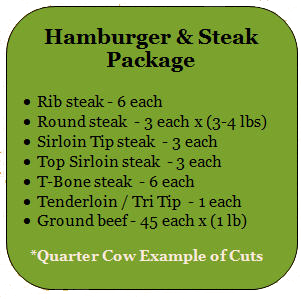 Your quarter includes cuts from both hind and front of the animal for a variety of beef. Note that these are approximate quantities that vary by each animal. The example is based on a 700 pound hanging weight. Click here for a visual poster of beef cuts (PDF). When can I visit the Ranch? You are more than welcome to come out for a tour or just to say hi, but please set up an appointment with one of us thru our contact form or by reaching us on one of our phones first. Looking for Grade A grass-fed raw Cow’s Milk? We recommend Pride and Joy Dairy, located in Grainger, WA. Visit their website Pride and Joy for more information. They do serve the Seattle market.